Layout Design: We work with you and your site's dimensions to formulate a design best suited to your needs and preferences. The plan will incorporate your choice of field and relief tile of various sizes, mouldings, borders, corbels, hoods, shelves, etc. In many instances, our stock patterns permit extensive possibilities without custom costs. Our skilled in-house design team looks forward to helping you design your installation. Custom Carving: Our custom handbuilding and carving services require a unique combination of thoughtful design work and competent craftsmanship. Our designer creates an original drawing adapted from your photo, business logo, or other image. 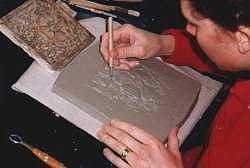 Next, our master carver works from this drawing, using her own sensivitve interpretation of the drawing, and transfers it to the medium of clay. Finally, a custom mold is formed, from which your original tile is pulled. Custom Color Matching: The color method developed by Ernest Batchelder was unique to his tiles. After many years of research, we at TRC have recreated this method. One of the services we are now able to provide is custom color matching. Whether you need to coordinate with paint samples, tapestry, or original Batchelder tile, we can be of assistance to you. $75.00 per hour after 1st hour. We have complete facilities for custom design and welcome inquiries. We have complete facilities for custom design and we encourage inquiries.